The Canary Islands are probably the most guaranteed wind you could get anywhere in the world. The trade winds have been used for hundreds of years to navigate ships down the Atlantic. Consistent wind is very rare to find in the world, many places will promise the earth, but we all know no one has control over mother nature. 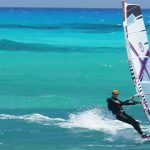 There is a very high local standard of windsurfing so you won’t be alone on a mast-and-a-half day, nor will you be short of inspiration when it comes to freestyle. We offer surf lessons for all levels of surfer from beginner through to advanced. Our aim is simple...we want to improve your surfing! We make sure that by the end of your course your surfing has seriously improved. Sotavento offers a fast, fun, windy Freeride destination that will add real zip to your windsurfing. Off the water you'll get a taste sensation with fresh tapas and fresh Canarian cuisine, plus the renowned WINDWISE location guiding and adventures.